Milgard® Windows & Doors announces the expansion of window configuration options available for Hermosa Series vinyl windows, designed specifically for the Texas market. "We specifically incorporated the sloped sill to provide exceptional water shed capabilities for our large Texas storms. Also, because we assemble this product locally we are able to provide short lead times for our customers," said Bill Schmidt. 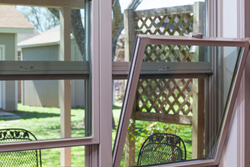 Milgard® Windows & Doors announces the expansion of window configuration options available for HermosaTM Series vinyl windows, designed specifically for the Texas market. These are in addition to the picture windows, single hungs and sliders that launched the Hermosa line. Milgard extends a Full Lifetime Warranty, including parts and labor, to the original purchaser of Hermosa Series vinyl windows for as long as they own their home. Plus, this now includes Glass Breakage coverage. Milgard Hermosa Series vinyl windows are available in eleven exterior frame colors to coordinate with any home design. There is also a Z-bar frame option (also known as Flush Fin) for replacement applications where aluminum windows are in place and the exterior is stucco or masonry. These windows have an exterior flange that is designed to conceal the existing window's frame. In 2010 Milgard entered the Texas market and created the Hermosa Series vinyl window line, with the sloped sill, in 2015 to address needs of Texas homeowners. Headquartered in Taylor, Michigan, Masco Corporation (NYSE: MAS) is one of the world’s largest manufacturers of brand-name consumer products for the home and family. For more information, visit masco.com or call 313.274.7400.